Is Tarte Makeup Really All Natural? 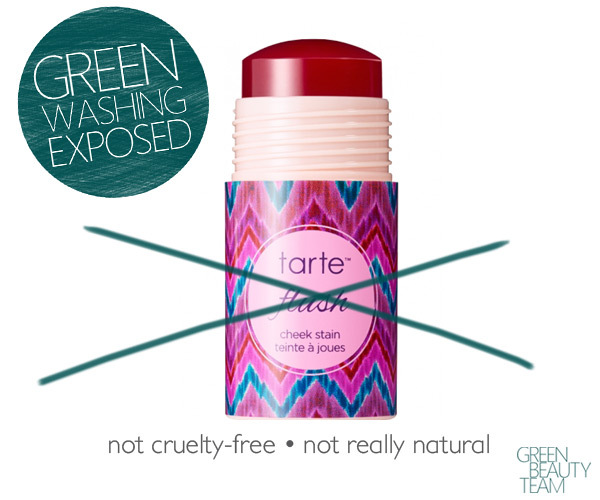 I am fed up with people being mislead into thinking that Tarte Cosmetics is an authentically green, natural cosmetics brand. If you’ve been buying Tarte because of your cruelty-free or vegan ideals, prepare to be pissed off. I’m not into brand-bashing or fear mongering. I’ve always done my best to keep Green Beauty Team a positive, well-researched resource for natural beauty solutions. That said, the first time I ever called out a cosmetics brand for greenwashing, was on The Green Divas Radio Show — and boy did it feel good! After that my list of the biggest greenwashing cosmetics brands went viral within minutes of posting! This post will inaugurate a series of articles to go deeper into why each brand made it on my list. I’m starting with the brands folks seemed to be most surprised/upset about, and in this case the one that makes me the most upset: Tarte Cosmetics. Tarte Cosmetics beats the drum that their products are formulated without, parabens, mineral oil, phthalates, triclosan, sodium lauryl sulfate, and gluten, and that they are cruelty-free. All of that is commendable, but Tarte is still blowing smoke. Can we just pause at sodium lauryl sulfate? It’s a foaming agent used in soap, not used in makeup. So why are they even saying it’s not included? If you thought you were buying Tarte as a cruelty-free, no animal by-product brand, then you would be mistaken. Their highly praised “Natural Beauty Cheek Stain” includes carmine! Hello, that’s crushed beetles! What else aren’t they disclosing? Let’s not pass over the ingredient “parfum/fragrance” listed on the cheek stain with no indication of what the source is, so that means it probably contains pthalataes like every other undisclosed fragrance on the market. Helianthus annuus (sunflower) seed oil, ricinus communis (castor) seed oil, hydrogenated castor oil laurate, Candelilla Cera/Euphorbia Cerifera (Candelilla) Wax/Cire de candelilla, cera carnauba/Copernicia Cerifera (Carnauba) Wax/Cire de carnauba, butyrospermum parkii (shea) butter, oryza sativa (rice) bran wax, glyceryl oleate, trihydroxystearin, parfum/fragrance, caprylyl glycol, vitis vinifera (grape) seed oil, tocopheryl acetate, lycium barbarum fruit extract, citral, citronellol, linalool, euterpe oleracea fruit extract, malpighia punicifolia (acerola) fruit extract, punica granatum extract, passiflora incarnata fruit extract, carmine (CI 75470), Iron oxides (CI 77492). Let’s look at their famous “Amazonian clay 12-hour full coverage foundation SPF 15”. It begs for you to believe it’s green! It’s got a nice leaf and a bamboo cap to make you think it practically came straight off a tree. Add in Tarte’s trademarked phrase all over their marketing materials “high-performance naturals” and you have a package that is totally misleading about what’s inside the formula. That, my friends, is the epitome of greenwashing. The SkinDeep database gives this item a high toxicity rating of 7 out of 10. Now before y’all get all crazy telling me how EWG isn’t an accurate source of information, it is only one piece to this greenwashing web of deceit. Below is the ingredient list for one of their popular shades in this formula. Let me know how long it takes you to get to all those naturals (after water)…ready go! light-medium sand: Water, Cyclopentasiloxane, Octyldodecyl Neopentanoate, Butylene Glycol, Polyglyceryl-4 Isostearate, Dimethicone Crosspolymer, PEG/PPG 18/18 Dimethicone, Dimethicone, Silica, Cetyl PEG/PPG-10/1 Dimethicone, Stearic Acid, Aluminum Hydroxide, Sodium Dehydroacetate, Phytantriol, Hexyl Laurate, Triethoxycaprylylsilane, Nylon-12, Sodium Chloride, Kaolin, Tocopherol, Tetrahexyldecyl Ascorbate, Nylon-12 Fluorescent Brightener 230 Salt, Polyvinylalcohol Crosspolymer, Magnesium Chloride, Potassium Chloride, Zinc Chloride, Lysine, Sodium Hyaluronate, Hexylene Glycol, Caprylyl Glycol, Phenoxyethanol, Potassium Sorbate, Mica, Titanium Dioxide, Iron Oxides. 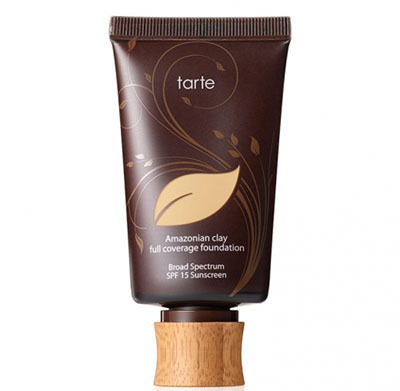 You’ll see a huge focus on Amazonian Clay as their star ingredient, which totally distracts the customer from digging through the “mud” of what else is in Tarte’s products. That kind of got me wondering if it’s sustainably farmed clay that’s not hurting our eco system in its procurement. I couldn’t find any info out on their website, so I sent an email to their customer care. As of publishing this article I have yet to receive a reply from the brand. I will update with their response as soon as I have it. Tarte wasn’t even founded as a natural brand. 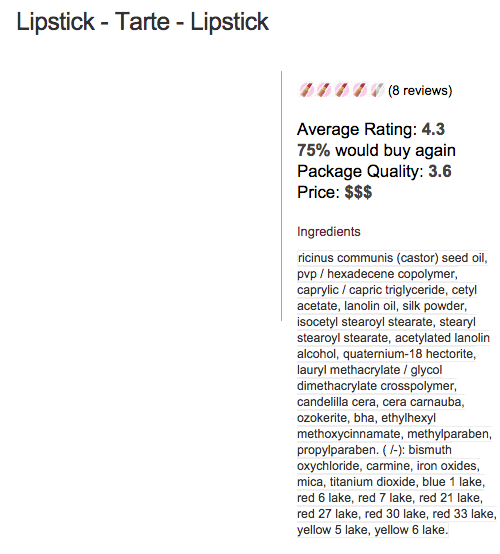 I managed to find an old ingredient list for Tarte’s lipstick from October 1, 2002 on Makeup Alley [source]. WOW! Animal byproducts, formaldehyde releasers and parabens abound! Early press releases of the brand’s founder Maureen Kelly say nothing about her slant towards natural [source]. The only mention of being green is her lack of experience in starting a cosmetics brand. In subsequent articles you’ll find her being praised for knowing exactly what the consumer wants. I think it’s safe to say she cashed in on the green, natural bandwagon as early as possible for profits, not for ethics or she’d have done this all very differently. They seem to be big on trade marking phrases that sound fabulous and mean zero. In fact, my guess is they had to strike the claim that they offered the widest selection of natural cosmetics because it’s just false. Ironically, despite Tarte’s attention-getting marketing concept, their products aren’t any more natural or healthier than loads of other products. We take particular issue with the company’s claim of being preservative-free, synthetic dye-free, and talc-free. Not only are these ingredients not a problem for most people, but also many of Tarte’s products do contain them! What is that about? Didn’t anyone at Tarte read their own ingredient labels? Smack! She called them out big time. Polyglyceryl-2 Triisostearate, Simmondsia Chinensis (Jojoba) Seed Oil, Octyldodecanol, Pentaerythrityl Tetraisostearate, Polyethylene, Candelilla Cera/Euphorbia Cerifera (Candelilla) Wax/Cire De Candelilla, Diisostearyl Malate, Stearyl Dimethicone, Tridecyl Trimellitate, Bis-Diglyceryl Polyacyladipate-2, Glyceryl Ricinoleate, Synthetic Wax, Octyldodecyl Myristate, Polybutene, Butyrospermum Parkii (Shea) Butter, VP/Hexadecene Copolymer, Cera Alba/Beeswax/Cire D’abeille, Ethylene/Propylene/Styrene Copolymer, Cera Carnauba/Copernicia Cerifera (Carnauba) Wax/Cire De Carnauba, Mentha Piperita (Peppermint) Oil, C10-30 Cholesterol/Lanosterol Esters, Silica, Butylene/Ethylene/Styrene Copolymer, Tocopheryl Acetate, Limonene, BHT, Linalool, Astrocaryum Murumuru Seed Butter, Theobroma Grandiflorum Seed Butter, Tocopherol, Mica. May Contain/(+/-): Titanium Dioxide (CI 77891), Red 7 Lake (CI 15850), Red 28 Lake (CI 45410), Red 30 Lake (CI 73360), Yellow 5 Lake (CI 19140). A site I really like for accurate ingredient data is CodeCheck.info. If you use google chrome you can use the automatic translate option to convert everything from German to English. Also it points out that Myristate is probably palm oil, which as many of us already know, is quite controversial due to its production and related destruction of the rain forests. diisostearyl malate, polybutene, octyldodecyl neopentanoate, pentaerythrityl tetraisostearate, polyethylene, bis-diglyceryl polyacyladipate-2, ricinus communis (castor) seed oil, vp/hexadecane copolymer, isononyl isononanoate, aroma/flavor, c10-30 cholesterol/lanosterol esters, lauryl methacrylate/glycol dimethacrylate crosspolymer, 1,2-hexanediol, caprylyl glycol, butyrospermum parkii (shea) butter extract, cocos nucifera (coconut) oil, mangifera indica (mango) seed butter. May Contain/ Peut Contenir/ (+/-): yellow 6 lake (CI 15985), red 7 lake (CI 15850), iron oxides (CI 77492), blue 1 lake (CI42090). As of 2014 the brand was bought out by Kose, a Japanese company. Tarte has since changed their marketing lingo and further refined their ingredients, but they have a LONG way to go before they are truly the natural brand they present themselves to be. I’m all for brands cleaning up their act and hope that more will do the same, but not if it involves blatantly lying to the consumer for a boost in profit margins. So what do you think about all this? Were you shocked or not at all surprised? Will you buy Tarte in the future? Leave a comment below! My disclaimer: The information presented is my opinion based on *a lot* of research. When a company gives incredibly strong suggestions to the consumer that they are green/natural (through packaging ploys, sales material, or even making full ingredient lists hard to find), I take issue. You might disagree with my perspective on what constitutes greenwashing. That’s cool. There’s no real definition for it anyway. I just ask that keep your comments classy and constructive. Do your own research on each brand’s ingredients and decide for yourself what is good enough for you. This series is not as much about shaming as it is about bringing to light subjects allowing us to be more informed consumers and hopefully encourage brands to be more truthful in their marketing practices and formulations. 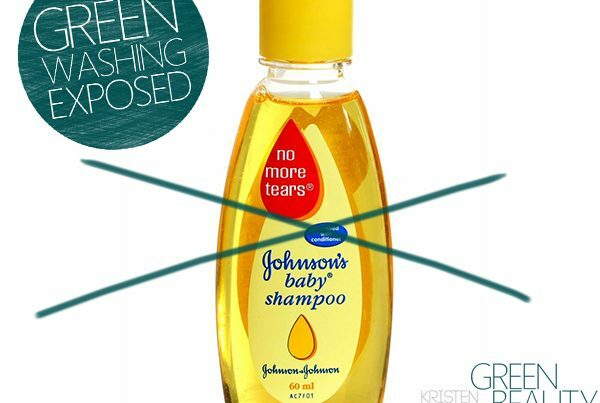 Next PostGreenwashing in Cosmetics. The brands doing it may surprise you. I realize this might be an older article, but I want to say thank you for this. I appreciate SO MUCH all the time and energy you put into you cause. I initially started to investigate Tarte because I was afraid of talc. I was searching talc-free beauty brands, and frankly, Tarte came up. Weird, right? So I went meandering around the website and thought I hot the jackpot with the beautiful shape tape powder… Well…wrong .. I think talc is the second ingredient. I’m embarrassed to admit it, but after having such a hard time finding a suitable talc-free powder, I just said screw it and bought the shape tape powder. It’s nice…I like it…but it’s not talc free. They lie… I get that. I bought a talc free powder by IT cosmetics, the Bye Bye Pores, and honestly, it’s amazing for being, like, a bra for my face that holds oils in…and it IS talc free…but it’s definitely chalky and weird. I still use it though. I’d love to hear you roast Drunk Elephant. I use their products, but they’re sort of…like…clique based. They only share blonde or Asian women in their social media….and something about a brand that uses that much plastic in their packaging stints to me. Hi. I used the foundation and was allergic to it. hello 🙂 I am trying to go nontoxic…for those that have used the tart amazonian clay…what is an alternative? Juice beauty?…any suggestions would be great thank you! this was very informative. Branding can be so deceiving. As cheesy as it sounds, don’t judge a book by it’s over. I would love to use products that are non-toxic etc and tried RMS, NU etc but either they contain coconut oil or cakey. Do you have any recommendations for products that are good for sensitive, dry skin, but don’t contain coconut oil, propylane glycol, fragrances? Thanks so much! They also manufacture popular Bioaqua facemasks, respectively Kylie Jenner makeup. Hard to know if the ingredients list is really to be trusted. Kristen, I wish I had read your article before I walked into the Ulta store with my daughter to purchase some makeup last February. My daughter had the most beautiful sunkissed skin that I have ever seen. After purchasing tartes foundation as recommended by the stores manager and one use, my daughter’s skin was ruined. Her face looked like it had a mask on it. The foundation burned and discolored her face with large bumps and dark spots all over. I wish I could attach pictures. I would like to send you before and after to post. She was devastated. I have spent thousands of dollars to try to get her skin back to is original state; which at this time seems impossible. Do not use this makeup. We were told by the manager that this was a natural classy makeup that would be wonderful and not hurt her beautiful skin. I am truly just wondering– if your daughter’s skin was truly beautiful and sun-kissed (this is not to say that she is not physically beautiful, I am commenting on her skin), why would you buy foundation for it? It does not make sense. Why cover up what is perfect. You should also let Tarte know what happened to her! Send the pictures, get doctors to look into her skin, and go public with this information to get a response from Tarte! I have used Burt bees lipstick for a very long time as I thought they are 100% natural and I stopped buying other brands. Several months ago I was told they use carmine as one of the ingredients.. I was shocked. I sent them a complain letter and they refuse to honor my request. People have to know the truth. Especially if you are vegan or wants to buy cruelty free products. Don’t buy Burt bees. Don’t support them.. they are misleading people. We are aware that for some people who adhere to strict vegan or vegetarian lifestyles, it is hard to understand why we would choose to use this ingredient in our products. Carmine, as you may already know, is an extract taken from the shells of the cochineal beetle. It is a common ingredient used in the cosmetic and food industry. We choose to use this ingredient because it is natural and it provides a unique red/blue pigment in our formulas, without compromising our product quality and aesthetic standards. We believe it is a better alternative to compounds such as D&C Red #7, D&C Red #6, which are 100% synthetic, or FD&C No. 40, which is derived from coal tar (a non renewable fossil fuel). While there are other natural pigments, we do not feel they provide a desirable color and feel and we will continue to investigate raw natural materials that could replicate the properties of carmine in our color products. Also, their site says no animal testing, I can’t find anywhere that it says vegan formulas, can you point me to the page that you found that on? Website also some products are 99% natural and over 50% are 100% natural. It sounds like you didn’t do any research at all, you just went by what someone says to. A company can’t just “honor your request” and stop using an ingredient cold turkey. They would have to pull an item from their product line, etc. which no one does. They claim to be working on an alternate. Take a breath and do some research, and become educated, please. Have a good week! Cami, using beetle parts is not cruelty free, no matter which way you try to spin it. After read your research…. I only found out that my eyelids allergic caused from “CARMINE”, I have bought TARTE eyes shadow palette few months ago… this few weeks my eyelids start itching and getting allergic. I “thought” TARTE is natural and cruelty-free, but it’s directly testing on human being, girls if you have a allergic skin, better read careful the ingredients before buying. bummer…..I bought my first eyeshadow Tarte kit this past Christmas and 2 months ago started with under eye irritation, thought it was anything BUT the eyeshadow that I was using. Won’t buy again. Thanks for this post! Arrrgh! I’m so sorry to hear that. Keep me posted if it turns out that was the reason. It is likely the carmine in it irritating you. Thank you for your research. I found this article after purchasing tarte Amazonian clay foundation. I only bought it because I thought I was getting chemical-free, all natural foundation with no harmful ingredients. I’m new to the market of natural beauty products without any harmful ingredients and am finding that it’s so difficult to find a brand that I can trust. Do you have any recommendations? Aimee, try Elate Cosmetics. They’re toxic free, cruelty-free, and vegan. Thanks for the comment, Stefany. Glad to see you’re switching brands. How about Gressa? 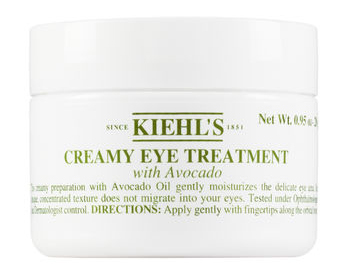 That was also on my beauty awards list. Curious what your thoughts are on Jane Iredale? Yes, it was written in 2015, but all you have to do is go look at the ingredients on their current site and you’ll see that they’ve not changed. 🙁 I didn’t link to their products because I have no interest in driving traffic to them. They also aren’t gluten free as they say. One their main ingredients in a lot of products is barley. Aka GLUTEN!! I’m celiac and I’m beyond tired of companies saying they’re “gluten free” when their printed ingredients list right beneath the claim shows GLUTEN. Just purchased Tarte products from Ulta. Will be returning tomorrow after reading your article. Thank you for your research. I am like your other readers. I am looking for all natural /organic products. So hard to decipher the BS! I don’t know why people have to CRUSH BEETLES to get red colouring. That’s pretty brutal and unnecessary. It’s like using blood when you can use a frikkin beetroot. There are tons of foods out there with red skins (grapes, apples, berries, cherries…). I’m pretty sure that with the millions of dollars being thrown at cosmetics, someone could find a way to use “acai extract”, not just on their label (**rolls eyes**) but as a truly sustainable healthy source of colour. I use pure organic acai powder (the one I get here in South Africa is a sort of dark pinkish shade, not violet or purple, so it seems to come in different colours for whatever reason?) It’s grainy, so I crush it with a mortar and pestle, and then mix it with my other natural ingredients, like clear aloe vera gel, white pure mineral salts, cinnamon, organic zinc oxide sunscreen, etc. If I can do that in a country where “gluten free” only got big in the last 5 years, it must be possible in other countries too, I hope. People use to use pomegrantes. They work better dried, but you can naturally tint your lips. It will go rancid after a few days, so you would have to use preservatives. Unfortunately, I can’t seem to find any preservatives that are safe, but I’m still researching and looking. I’ve used beets too. Just strain them and mix it with some coconut butter and beeswax. I’m not vegan, so yes, I use beeswax. I’m sure there are other alternatives. I just don’t want to use synthetic wax or ozerkite wax. thank you so much for doing this Research. I especially want to thank you a thousand times for mentioning and researching via http://www.codecheck.info. As a bilingual Reader of german and english Blogs, I noticed a LOT of ingredients allowed in the U.S. are apparently not allowed or viewed very critically in the E.U. Example: I first wholeheartedly bought into mentionend Paula Begoun’s own Skin care line without checking on Codecheck. When it arrived, i noticed the siliconey feel a lot of the potions had. When I finally checked on Codecheck, I couldn’t believe how many ingredients listed as “very critical” or even “harmful” it contained! Another Point is the different Approach of the US and the EU: the US only seem to ban ingredients after they were proven to be harmful, whereas the EU bans them when there’s some indication it might be – aforehead, not after the damage is done. This makes EU Labels a LOT stricter than those in the US. So once again – THANK YOU so much for checking it on codecheck and also mentioning – and even recommending! – it. This is the most helpful Thing in that “green” or not so green cosmetics jungle we have to weed through. I love reading this so much, Vivien! Thank you too for taking time to share how this has helped you. Are you affiliated with them in any way? I only ask because I don’t know them personally and am curious about who is behind it. Yes, it’s true, the US is SO far behind in so many ways (not just ingredient safety). That’s the power of capitalism and the belief in less government. But that’s another topic. I’m so glad you are here. Please keep in touch! Thank you for this. . . and thank you for not dismissing beetles as just stupid bugs. I avoid carmine too. It may be “natural” but it’s cruel. Same with honey (it’s bees food and should not be stolen from them) and beeswax. This is a good read. As a vegan, I am constantly reading labels before I buy any food or skin products. But now, you have to be well informed about the manufacturing companies as well as the ingredients that go into their products. Its almost like you have to be a private investigator. All I can say is do your research and be careful ladies! Thanks Green Beauty Team! This is disappointing and it makes you see the true face of some cosmetic brands. Thank you for sharing this useful information! So is there even such thing as a natural full coverage makeup that is good for your skin. My skin is dry and I have lots of pimples but they are deep and stubborn as i live in a humid climate. Please help! ? ?Thanks for sharing too… was excited when I thought tarte would be good but did read the ingredients list and thought ummm what is all this crap. Glory Boon is actually a really good cruelty-free company, and their products aren’t too expensive. I checked them out recently, and they’re great! If only 100 Percent Pure would get their foundation colors right, things would be better in the cosmetics world. I am so glad I came across this, it has opened my eyes to shopping for cruelty free products. Do you know any companies that make good quality tinted moisturizer that is 100 percent cruelty free ? Also is the company 100percentpure cruelty free? I buy cruelty free and vegan products such as Inika, World organic, Living nature that do make tinted moisturisers (I also know of Juice beauty but have never tried their products). There are many out there. I live in New Zealand so I am not sure if the Inika, World organic or Living nature brands would be readily available in the shops for you (i.e where you live). However, I am sure that you can get them shipped(: Hope this helped you find more cruelty free, vegan and natural and organic brands! Good luck. It Cosmetics! Cc cream is amazing!!!! no, it isn’t. silicone laden, full of toxic by products. I am a vegan. What is the product chemical name to look out for if it is an animal by-product? I am a little wary of Octyldodecyl Neopentanoate, and those first ingredients on the product because that is the substance of the lipstick, so hope it’s not from animals. I don’t mind the crushed beetles so much as a crushed cow, pig, chicken or lamb. I don’t want those types of animals in my lipstick. That is too cruel. Yes it is cruel to crush the beetles but where else can they get their colors from for lipstick? I hope companies don’t lie or pretend about their ingredients to the consumers when asked about animal ingredients. For the past 10 years or so it has become a habit for me to read ALL labels (food, beauty, EVERYTHING) and only recently I came across some raving reviews about Tarte products for the fact that they are cruelty free and vegan. Being a vegan in all aspects of my life (not just food), I thought I would check them out. PEG alone is one of the worst ingredients you can put on your skin. I will always remember reading that PEG actually burned a hole in a table at full strength!! And we’re supposed to put that on our skin?!?! I’m so glad to have found this article, I wouldn’t have purchased Tarte products just because of the ingredients alone, but others that don’t want to read labels need to see this article. I’m hoping you can help. I’m looking for a natural, vegan BB cream or foundation. I’m looking for something to even out the skin tone of my face. I have a powder foundation that I like, but I need a tinted liquid/cream under it. Hi Deb, oh yeah…it’s such a bummer when you find out they aren’t the natural brand they claim to be. Let me know how you like the PF mascara! I don’t personally feel Titanium Dioxide is much of a concern if you are choosing the kind that is non-nano. Read our mineral makeup myth busting series here. I was googling and came across this article. I’m so glad I found this article as I’ve been over the last couple of years switching out all of my toxic makeup. Tarte was one of the brands I used to buy but I noticed their products along with a lot of other have been contributing to my acne all these years. It’s really sickening that the FDA is not more strict in the US. I know Canada and overseas have banned alot of toxic in their makeup amongst other household cleaning products. I use 100% pure and lily lily cosmetics. Lily lily is very reasonable price wise and ships out fairly quickly. Well done with this great article. I’m so glad I too used Google and read your comment. I just got back from a makeover at Ulta, and the associate used all Tarte products. The main reason I went was because of my worsening breakouts! I don’t need foundation that makes it even worse. But, side note, they got worse when I quit using all of my non-natural products. This is so hard , was heading to the mall to find a cover up foundation for my 12 yr old that started modeling a yr ago and also has tween hormones and cystic acne ..good luck to this mom wanting natural chem free oil free comedogenic makeup ? Thank you for writing this article-I am a natural beauty blogger that has been using Tarte for quite sometime and suggesting it to my readers. Because of a Facebook comment this weekend, I have taken a good hard look at what I am advocating and I just feel sick! I’m so glad to have found your site and am working on a post apologizing for this huge mistake on my part. Anyway, I just wanted to tell you thank you for all your research. Now I’m off to read more from your blog! Wow, Jennifer! That is really fantastic that you are willing to leave a comment like this, and vow to let your fans know. I think it’s so crucial that we are willing to shift as new information becomes available to us. I hope you’ll reference the post and give us a shout out! Best to you – xo Kristen Arnett. Thank you for this, but now I am even more confused. Tarte is on both Peta’s cruelty-free list and the Paula’s Choice/Beautypedia list. Both are sticklers, so I’m surprised they would have Tarte listed if they aren’t currently cruelty-free. I would imagine they say cruelty free because they don’t test their products on animals. Testing vs being an ingredient are two different things. http://germansoapbox.com is a new & growing brand that is vegan and cruelty free and that includes NO use of carmine! German Soap Box is also paraban free. btw…beetles are not animals. They are insects. an insect of an order distinguished by forewings typically modified into hard wing cases (elytra) that cover and protect the hind wings and abdomen. That definition and argument on semantics doesn’t take away from the idea that they are still killing a living being and claiming to be cruelty-free. I haven’t seen this posted anywhere as of yet so I thought I would comment on it. tarte cosmetics claims to be cruelty-free, but I’m curious if they are just using their own definition of cruelty-free or simply just playing on words. On tarte’s website it states, “At tarte, we strive to create products that support a healthy, compassionate and a environmentally responsible way of life. We never test our finished products on animals and we seek out suppliers with the same standards.” Funny how they don’t just simply state, “We don’t test any of our products on animals,” instead they add in that nice “finished products” in there which makes me skeptical to believe they truly are as cruelty-free as they say. The FDA even states, “The unrestricted use of these phrases by cosmetic companies is possible because there are no legal definitions for these terms. They then go on to say, “Our Product Development team sources and formulates your favorite products using ingredients of the highest quality, and they are safely tried and tested on the tarte team before arriving on shelf or sold online.” I feel like this is a case of hiding what’s right in front of you. Who exactly is the “tarte team” they are referring to? They say they are tried and tested before arriving on the shelf or sold online, which would mean at this point they would be a finished product but until then they would be “in the works” and judging by their use of wording that they “never test their FINISHED products on animals, kind of formulates the assumption that until it’s a finished product, they DO in fact test on animals. Oh, and then of course you have the ” We never test our finished products on animals and we seek out suppliers with the same standards.” except.. you don’t.. or maybe you have a short discussion on other options, but when money speaks, you actually sell yourself to companies like KOSE who are based in China and are NOT cruelty-free and are the exact opposite of those standards tarte supposedly seeks to hold. Just thought I would point a few things out. What brand do you recommend for truly natural makeup? Thx! Skin Care and Cosmetic marketing and wording has been really frustrating, and it seems to be getting increasingly worse. The lack of corporate responsibility is frustrating…I’m looking into simplifying my skin care routine to include Manuka Honey and Jojoba Oil so that I don’t have to pay for acne anymore. Haha! Yep, that’s one way to look at it – paying for acne. I totally agree with your statement about corporate responsibility. Thanks for taking the time to read and comment. I hope you’ll share this with your friends too. I love Josie Maran products. Any thought on that? They also claim to be organic. Josie Maran is totally greenwashing. Check out a few of The Green Beauty Team’s other articles and JM is listed as one of the “bad” guys. I’m no expert, but I would consider giving Pacifica and 100% Pure a try!! HTH!! THANK YOU so much for this article. I was just in Sephora and asked if they had any organic lines and was directed to the Tarte display. The sales gal went on and on about how organic they were and was ready to sell me the whole line. I told her I needed to come home and investigate. In the last 3 months I have thrown out all my makeup and skincare products in search of organic and non toxic. Everytime I think I find something I come home to research only to find another case of greenwashing. Why is it so hard to find actual organic products??! Thank you for this site and all your hardworking research put into finding the truth! Interesting. Tarte also has a trademark on “green glamour” . . . This is a very well researched and written post. Unfortunately, many brands use a few natural ingredients in their formulas to mislead consumers to believe they are natural or organic. I, for one, appreciate your honesty. Thank you for taking the time to write this piece! I am not against chemical ingredients as long as they are safe, but I think greenwashing is tremendously deceitful for the consumer, who shouldn’t need a Master’s degree in Chemistry to understand what she is buying. It’s only fair that things are disclosed properly so people can make informed choices. I just have to say on the actual ewg website, they rate their amazonian clay foundation as a 3. Its actually not that bad, but its not 100% natural. Greetings from Beraca. I am writing you today after reading your post about Tarte. If you would like to discuss the sustainability of the Amazonian White Clay please feel free to contact me. I do not speak for Tarte but would be happy to share more about natural and sustainable raw materials from the Brazilian Amazon. Are you bashing your soda and candy companies for using carmine for you red candy colouring. Probably not. The point is your writing a article whether you like it or not you will get criticising feedback. Well, I personally don’t drink soda or eat regular candy. So I’m not sure who you are replying to on this thread….The real issue here is that Tarte claims they are vegan and cruelty free, but they aren’t. Can you please list some brands (I’m in Canada) that are chemical-free? I’m really chemically sensitive and am searching for something that works. I was told to use Tarte and now I’m skeptical. Arbonne is fantastic – 100% natural, vegan, gluten and cruelty free and I couldnt recommend their products enough! Hi Madeleine, you may want to do a bit more research on Arbonne as they are not 100% natural, but the other things they say may very well be true. Hi try liz earle she a uk based and her prouducts are AMAZING .i been use her products for 16 years. You need to keep an eye on Liz Earle ingredients, some are ok, some are not. Some have changed and are now ok, but I stopped checking because I’d trusted their claims and yet when I took the time to actually check and found they weren’t as safe as they’d claimed I felt betrayed… For folks who want to avoid Phenoxyethanol, Methylisothiazolinone, Sodium benzoate, or Hydrogenated palm glycerides for example should avoid or look carefully at the full ingredient list that’s underneath at the very bottom of the page with the pretty pictures about the natural ones. Thanks so much for opening my eyes and I look forward to more. I’m really pissed off because I just bought the Tarte cheek stain. Crushed beetles? Ewww. You are so welcome, Marina! I ‘m really happy that you took the time to read and comment. I hope you’ll share this with your friends too. There’s so much to be weary of these days and hopefully our site can help you find better alternatives. Hi Cristina, That is a very interesting question. Dumbfounding, isn’t it? A lot of times the cruelty free means that they don’t test their products on animals. I’d have to dig a little deeper to find out if this is some kind of loophole in PETA’s process. Did you see this article on Cruelty Free brands that really aren’t so cruelty free anymore? It’s another expose you might like. I am so incredibly pissed off right now. I JUST purchased a ton of products from Tarte specifically because I thought they were vegan -because they SAY they are vegan. I cannot believe they can advertise as vegan when they use Carmine. They are on Peta’s Bunny-Free app listed as a cruelty free product but I suppose that is just in reference to animal testing and doesn’t take into account using actual dead animals in their products. Oh, there is so much hypocrisy in PETA. I’d suggest doing more research before supporting them. They do far worse than support products with dead beetles. Invertebrates, like beetles, are not considered animals under ethical research acts and such. That is why even though brands like Tarte have crushed beetles in their products, they are still considered cruelty free. I was into Tarte for several years but my eyes were reacting terribly to their shadows. Finally looked up the ingredients and realized they weren’t any different from any of the other companies I was allergic to! Thank you for this information. I have been reading things lately about how Tarte isn’t all it’s cracked up to be. I only use their eye shadow but will soon be looking for other alternatives. They had me at no parabens, no triclosan, etc. I should know better…I teach people to become ingredient detectives…should have done a better job myself on this one. This is just a small offering of all the massive #greenwashing going on my “natural” and “organic” cosmetic, skin care and body care products. The TRUTH of every product is in their ingredients list. Claims about what they don’t use is just a way to further greenwash their products. The ONLY way to know if your products are really what they say they are is to purchase food standard certified organic skin and body care products. There is a defined standard for certified organic, it is verified by an independent 3rd party, it’s not a company telling you they are “clean” “natural” “organic” etc. The food standard certified organic logo to look for is USDA, ACO (Australian Certified Organic) – NOT ecocert (which is a cosmetic standard and very different). There are tons of cosmetic “organic” standards but none of those meet the quality that food standard certified organic does. 95% or more organic ingredients, NO synthetic chemicals, NO #GMO ingredients. My point is this, don’t go by what the manufacturer says on the label >>> READ THE INGREDIENTS LIST… if it is full of synthetic chemical names you can’t pronounce it’s NOT natural OR organic. As the article very clearly states, this is the first in a series that I will write with my reasonings for each brand on the original list of 22. I can do it this way and it doesn’t make me bad. It makes me a person who would rather take her time producing quality articles, than a bunch of quick hit or miss, poorly written content. It took me 6 (six) hours to do the research and writing for this one post on Tarte. Plus it’s all for free. I don’t get paid to do this and as you’ll notice, there’s no ads on the site really. I have funded this project for 5 years alone. So I’m under no obligation to do anything according to anyone else’s time frame. I would rather appreciate supportive words and constructive help than calling me bad. Awesome — your hard work and research is highly appreciated!!!! As the owner of a small skincare company going up against these big guys, I research the hell out of my ingredients and only use ones you can pronounce!! Thank you. I’ve known for a while that Tarte isn’t so non-toxic. Their pot of eyeliner is pretty much the last thing in my possession that isn’t completely clean. (Oh yeah, and my Josie Maran SPF daily moisturizer.) I know there are good eye pencils out there, but do you have a reco for a good, non-toxic cat eye? You would make my month, if so. If you can use a liquid liner, Ava Anderson Non Toxic has one. Whilst I applaud you for trying to put an explanation to why you think Tarte is Greenwashed there are a couple of points that I disagree with, the first one is where you call them out for claiming to be SLS free when it is not usually found in make up, SLS is actually found in a surprising number of mascara brands, there are times when brands claim to be SLS free and I scratch my head for example nail polish (since when does it need to foam?) but in these things do pop up in formulations so I think it’s not the worst of their offences. The next one is saying they are not cruelty free because they have carmine, this is a huge bone of contention for many, but changes need to be made by the certification bodies like BUAV as they will still certify products with carmine, also how many otherwise natural brands do you know still use carmine… Kjaer Weis, Living Nature, Hauschka to name a few… As the demand for vegan make up grows so will the alternatives but for now many brands are still opting for it to avoid synthetic dyes so Tarte really are not on their own. Since I don’t really wear makeup, I’m not even sure if I’d heard of them. But this is an interesting expose’! I have been a long time customer of Melaleuca and will soon stop. Looking forward to a run down on Melaleuca. Always thought was a true green company. However, as I have become more educated by sites like yours I now realize Melaleuca is a B I G greenwasher. Many, many companies so much better than this greenwasher. When I first started using Tarte years ago, I was ignorant about being a sustainable and compassionate consumer; I just liked the cheek stain. Only recently did I actually notice all of Tarte’s “natural” claims and it really pissed me off. Bravo for your “expose” – cannot wait to see more! And TYTYTYTYTY!